Ultimate Nightly Essense contains key enzymes that support a wide range of systems and promote cardiovascular ,immune and gastrointestinal health. 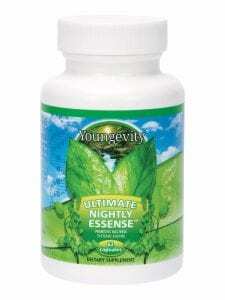 Ultimate Nightly Essense encourages normal hormonal balance, cholesterol levels, and healthier looking skin. Ingredients: Probiotic Bacteria Blend, (Bifidobacterium bifidum, Bifidobacterium breve, Bifidobacterium infantis Bifidobacterium longum, Lactobacillus acidophilus, Lactobacillus brevis, Lactobacillus bulgaricus, Lactobacillus casei, Lactobacillus helveticus, Lactobacillus lactis, Lactobacillus plantarum, Lactobacillus rhamnosus, Lactobacillus salivarius, Streptococcus thermophile), Systemic Enzyme Blend, (Protease, Papain, Bromelain, Nattokinase, Seaprose-S), Rutin, Inulin (FOS), rice extract and capsule (vegetable cellulose, water. Bifidobacterium bifidum, Bifidobacterium breve, Bifidobacterium infantis, Bifidobacterium longum, Lactobacillus acidophilus, Lactobacillus brevis, Lactobacillus bulgaricus, Lactobacillus casei, Lactobacillus helveticus, Lactobacillus lactis, Lactobacillus plantarum, Lactobacillus rhamnosus, Lactobacillus salivarius, Streptococcus thermophilus. Protease, Papain, Bromelain, Nattokinase, Seaprose S.